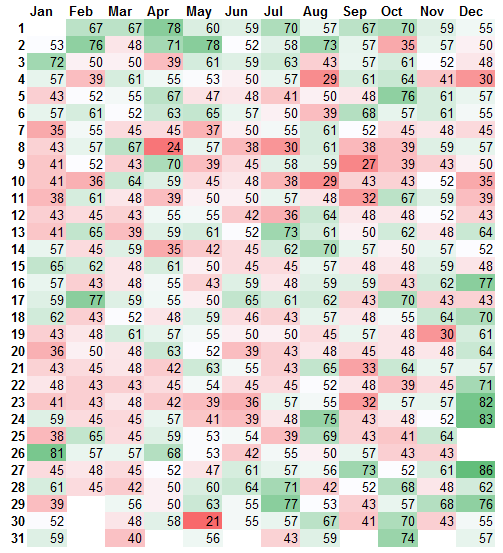 We have previously looked at data to see if there are any discernible patterns in market returns by day of the week. The following table presents another way of studying this. So far in 2016 the longest run of positive (or negative) returns for a day started in the 10th week of the year when day returns for eight consecutive Wednesdays were positive. 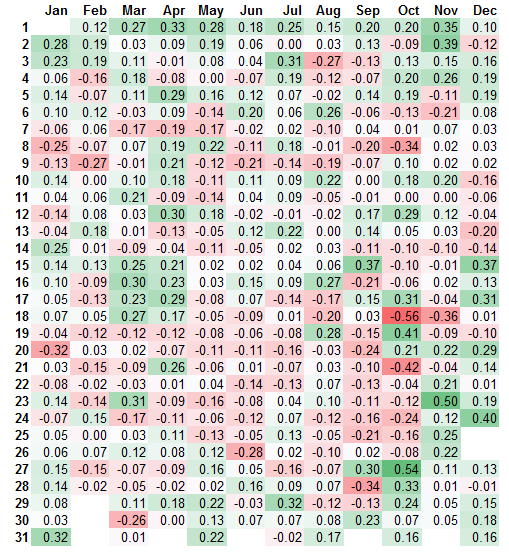 For 11 weeks, the day returns on Fridays were the opposite sign to that on the previous day (Thursday). This run ended last Friday (when both Thursday and Friday saw positive returns). Next Monday will be the last trading day (LTD) of October. 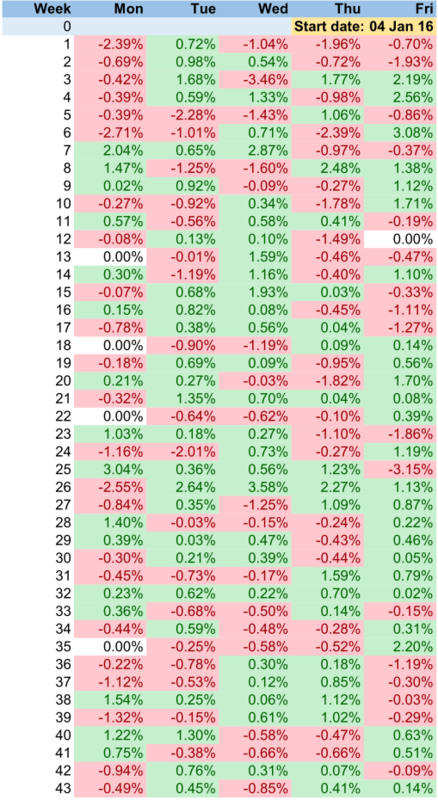 Historically, the last trading day of October has been the strongest LTD of any month in the year. 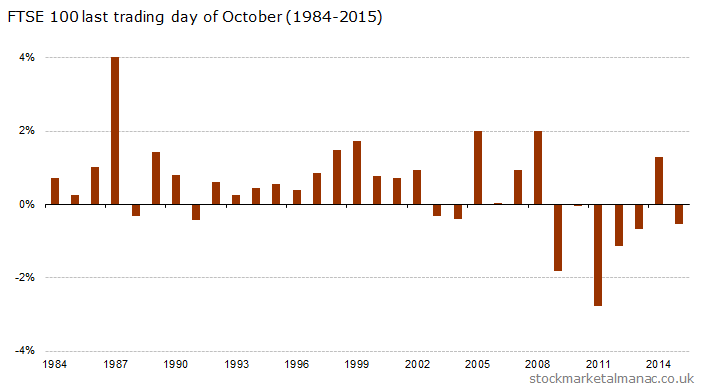 Since 1984 the market has on average risen 0.46% on the LTD of October, with positive returns in 69% of all years. As can be seen on the chart the market only fell twice on the October LTD in the 19 years from 1984 to 2002. One possible reason for this may have been that November is the start of the strong six month period of the year (this is part of the Sell in May effect), and investors could have been buying equities at this time in anticipation of that. However, in recent years this pattern of behaviour has changed. 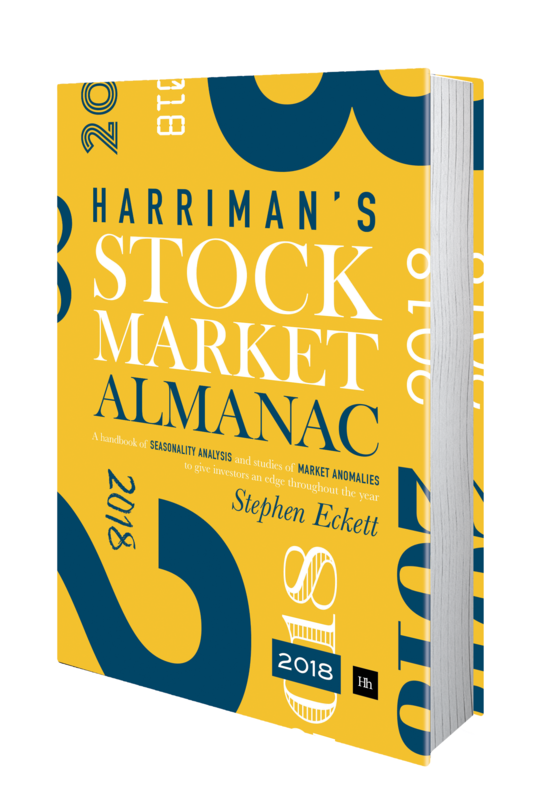 Quite dramatically so – in the last seven years the market has only risen once on the October LTD. Last year (2015) the FTSE 100 Index was down 0.5% on the last trading day of October. The Federal Open Market Committee (FOMC) is the monetary policy-making body of the U.S. Federal Reserve System. Since 1981 the FOMC has had eight scheduled meetings per year, the timing of which is quite irregular, The schedule of meetings for a particular year is announced ahead of time [calendar here]. Starting in 1994, the FOMC began to issue a policy statement (“FOMC statement”) after the meetings that summarised the Committee’s economic outlook and the policy decision at that meeting. The FOMC statements are released around 14h15 Eastern Time. Before 1994 monetary policy decisions were not announced; investors therefore had to guess policy actions from the size and type of open market operations in the days following each meeting. But since 1994 there has been far greater transparency over both the timing and the motivation for monetary policy actions. And the relevance to UK equities is…? The above quoted paper also found that such pre-FOMC excess returns occurred also in major international equity indices. 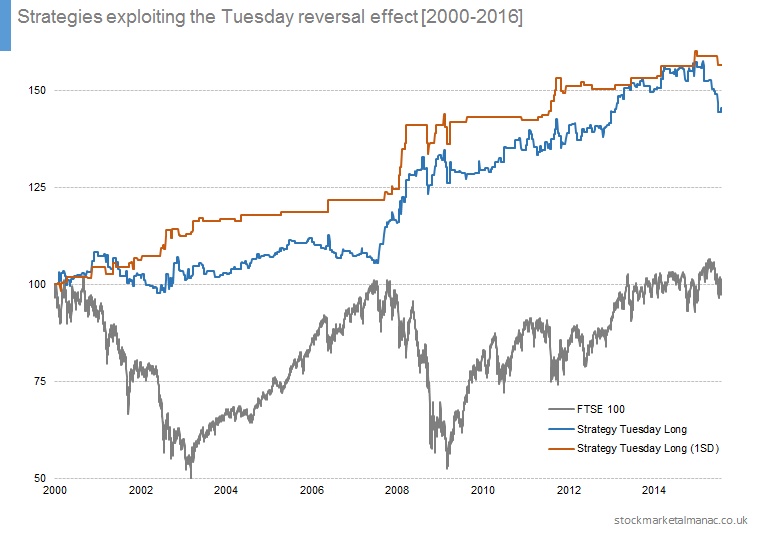 The following chart shows the average daily returns for the FTSE 100 Index for the seven days around the FOMC statements for the period 1994-2014. The seven days cover the three days leading up to the statement, the day of the statement itself A(0), and the then the three days after the statement. Given that the FOMC statement is usually released around 18h15 GMT (i.e. after the UK market has closed), A(0) can be taken as occurring in the 24 hours before the statement. The result is quite clear, the average daily return for A(0) is 0.33%, over ten times greater than the average daily return on all other days. This does support the claim in the above referenced paper. It might also be interesting to note the weakness in equities on the day prior to the FOMC statement. 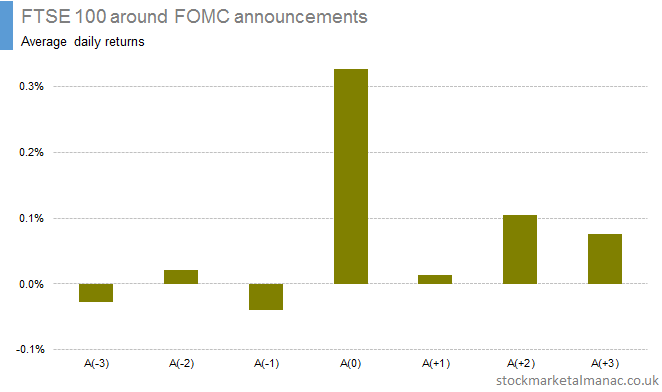 Further articles on the Fed Rate and FOMC announcements. Do European stocks follow the US on a daily basis? Do European stocks follow the lead of the US market from the previous day? In other words if, say, the US market is down one day are European stocks more likely to fall in their trading session the following day? 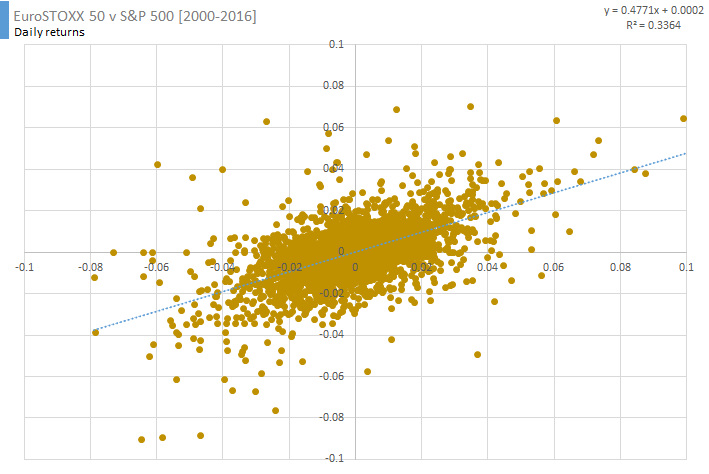 To test this the following chart plots the daily returns of the S&P 500 Index against the corresponding daily return of the EuroSTOXX 50 Index for the following day. There is a positive correlation here, but as can be easily seen it is a very weak correlation. And this observation is supported by the very low R2 of 0.05. So the immediate answer to the question of whether European stocks follow the US is: only very slightly. However, the following chart is interesting. This next chart plots the daily returns for the two indices as above, but this time it is the daily returns for the same day. In other words, this time the US market movements come after those in Europe. As can be seen, here the correlation is higher than in the above first case. The R2 = 0.3; which while not statistically very significant is quite a bit higher than in the first case. So, this might suggest that it is the US market that follows Europe. Probably not. Rather it is likely to be a feature of the trading hours of the respective markets. The illustration below shows the trading hours for five exchanges. NB. Strictly, UK and Swiss stocks are not in the EuroSTOXX 50 Index but the exchanges are included here for reference. The times referenced here are UTC – which are accurate at the time of writing (in May), but will be shifted one hour when countries switch to Daylight Savings Time. However, for the purposes of the discussion here the times are fine, because what we are interested in is the overlap of trading hours at the end of trading in Europe and the beginning of trading in New York each day. As can be seen, each day there is an overlap of a couple of hours between the Paris and New York exchanges, and longer for Frankfurt and New York. Each day European markets can be active at their open in the morning (reacting to overnight developments – including US stock movements), then often these markets can tread water for a while waiting for the US market to open in the afternoon. The European markets can then take their lead from the US for the rest of their trading day. The higher correlation seen in the second chart above is therefore probably reflecting this overlap period when European stocks are influenced by what is happening in the US that same day. 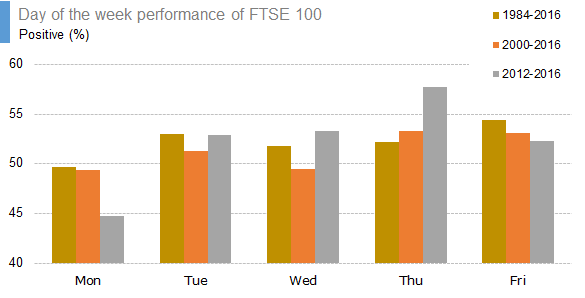 We last looked at the performance of the FTSE 100 Index on the days of the week in September 2014. Time to see if anything has changed. 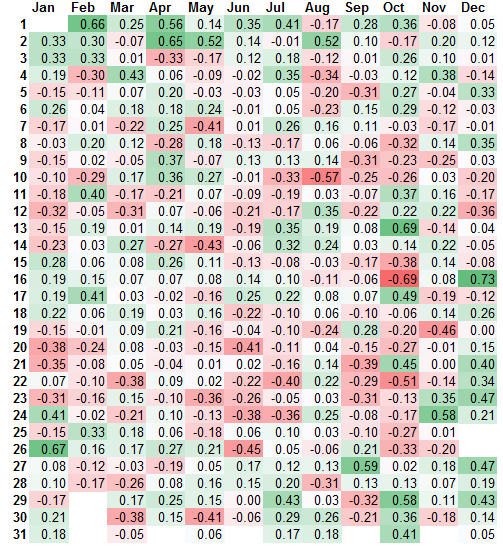 First, to review how the Index has performed on the different days of the week over a range of periods. 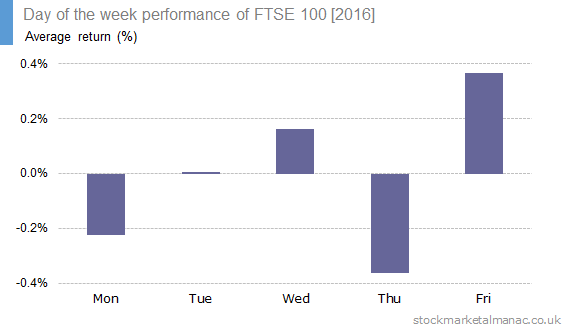 The following chart shows the average returns of the FTSE 100 Index for the five days of the week over the periods 1984-2016, 2000-2016 and 2012-2016. 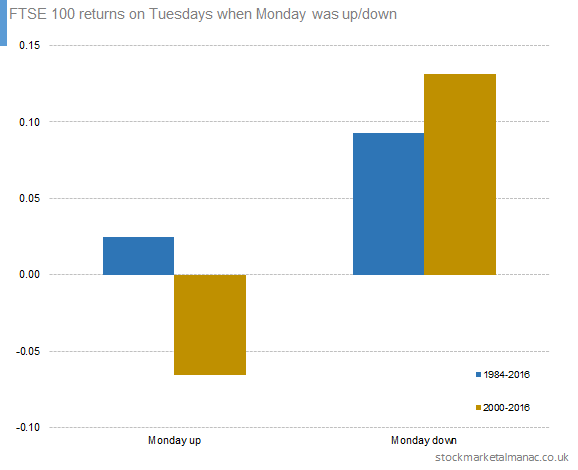 For example, since 1984 the Index has fallen by an average 0.025% on Mondays. Broadly, a similar profile of behaviour can be seen over the three periods. Namely, the Index is weak on Mondays and Wednesdays and relatively strong on Tuesdays, Thursdays and Fridays. The weakest day is obviously Monday, while the strongest day is Tuesday (this profile has been particularly strong in the last four years). It can be observed that the strength of the market on Fridays has been steadily declining in the three periods shown here. The following chart is similar to the above except instead of average returns it show the proportion of days seeing positive returns. For example, since 1984 the Index has risen on 49.7% of Mondays. The profile seen here is similar to that seen in the first chart. The weak day again is Monday, although here Thursday is relatively stronger. So, that’s the longer term, let’s look now at the behaviour so far in 2016. 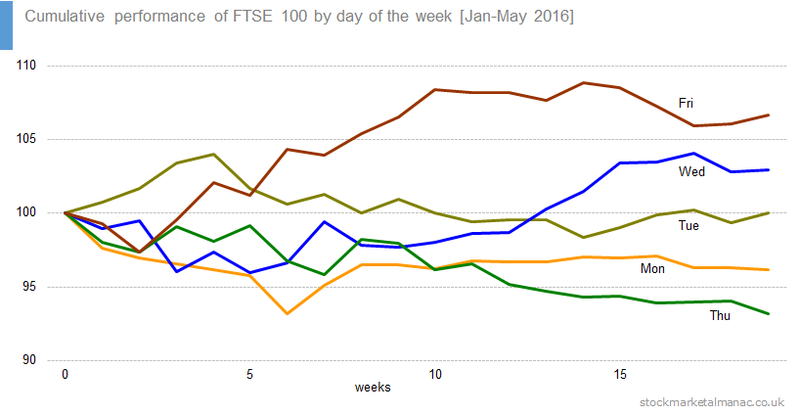 The following chart shows the average returns of the FTSE 100 Index for the five days of the week over the period Jan-May 2016. As for the longer term, Mondays are still weak. However, previously strong Thursday is now the weakest day of the week. So far this year it is Friday that has seen the highest average day returns. 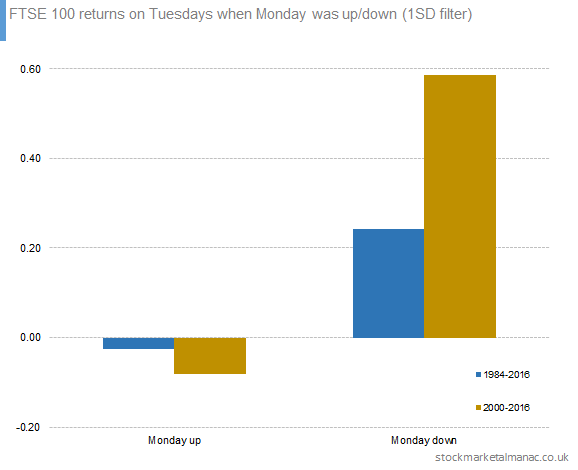 The following chart shows the proportion of positive return days for each day of the week. 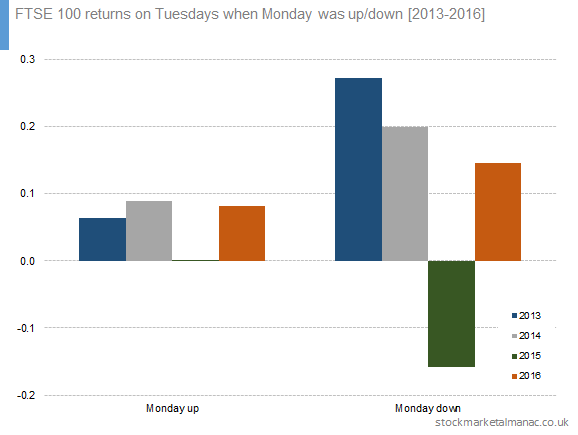 This chart reinforces the observation that Mondays and Thursdays have been weak so far in 2016. But the day with the most positive day returns has been Wednesday - which arguably can allow it to claim the strongest day of the week crown so far in 2016. 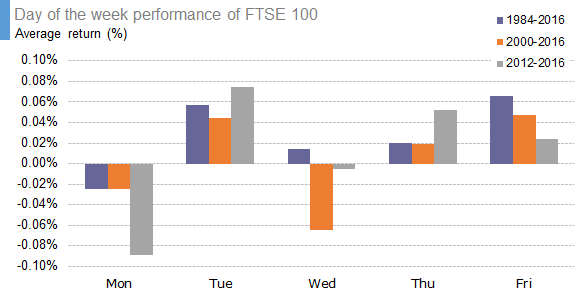 The following chart shows the cumulative performance of the Index for each respective day of the week. 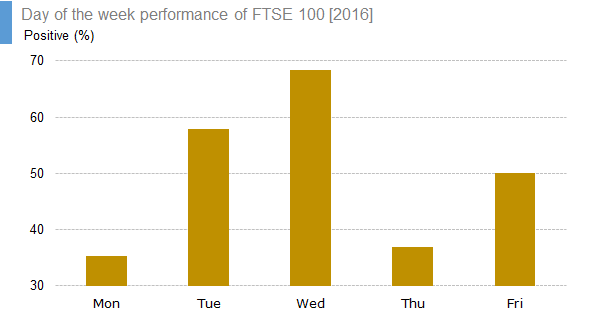 For example, the FTSE 100 Index has a cumulative return of 6.6% for all Fridays so far in 2016. Further articles on the Day of the Week Effect. 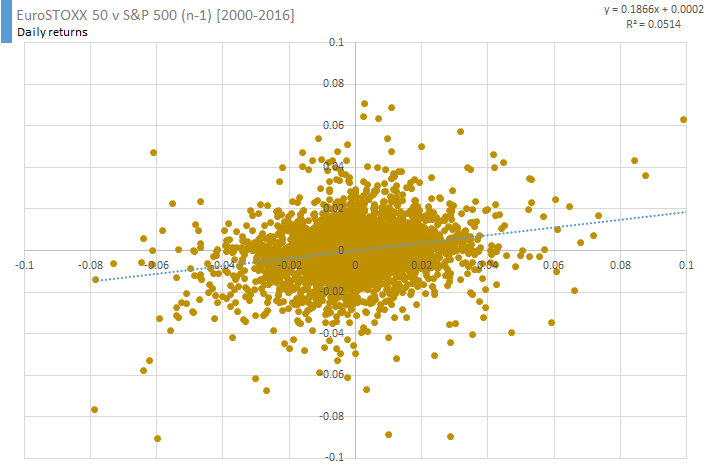 This updates a previous article with the latest figures for the average daily change and positive daily returns of the S&P 500. 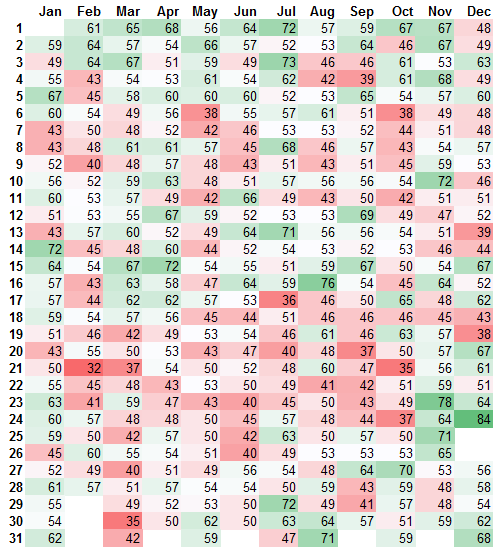 The table formatting and analysis is largely as before; except the charts now use a smoother gradient of colours to indicate number magnitude. This updates a previous article with the latest figures for the average daily change and positive daily returns of the FTSE 100 Index.